All But My Life begins at 9:10 a.m. on September 3, 1939, when the Nazis invaded the Weissmann’s home town of Bielitz, Poland. Immediately her family lost any sense of safety and security. About the beginning of October there was a timid knock at the door. It was not the ominous thump of the Gestapo, but a hesitant, tired signal. It is strange how many feelings a knock can express, if you listen carefully. The book chronicles the progressive losses which accumulate one after another after another through the days after the end of the war. It is staggering. Layer by layer, everything Gerda treasures is stripped away. When she is liberated the only valuable thing she owns are the ski boots her father insisted she wear on the June day three years ago when Gerda was transferred out of the ghetto to a labor camp. Her love and admiration of her older brother Artur, made his loss one of the heaviest of all. At our final parting, when I was fifteen and my brother nineteen, he asked me to be brave and take care of our parents. My promise to him was my most sacred vow. And during the years that followed, I did the best I could–always, I suppose, in the hope that he would praise me when we next met. How could I have imagined that on a snowy winter’s night many decades later, in a suite at the Waldorf-Astoria Hotel in New York, Prime Minister Menachem Begin of Israel would express the fulfillment of part of that irrational hope when he took me into his arms and said, “I have waited so long to meet Arthur’s little sister.” As I wept, he stroked my hair and said, “You have been very brave.” He had never met my brother but had read what I wrote about him, and with uncanny sensitivity he had identified with us; thus he gave me the praise I had hoped to hear from my brother. 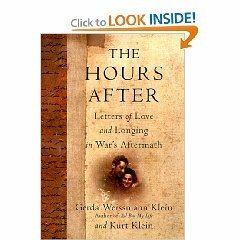 Gerda’s story continues with The Hours After: Letters of Love and Longing in War’s Aftermath . The first American soldier to see Gerda on Liberation Day was Kurt Klein. In spite of her filthy, broken down, ematiated figure, there was a spark in Gerda which immediately attracted Kurt. A Lieutenant in the Army, Klein was also Jewish, born and raised in Germany before he emigrated to America. Two months after meeting her and the evening before he was shipped to another location, Kurt asked Gerda, alone in the world, to marry him. Their letters during their year of separation before they could marry form the framework of this book. This book grew on me, the second half more absorbing than the first. 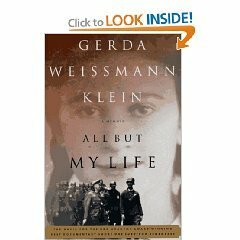 Gerda’s daily letters offer a mosaic of life in Munich immediately after the war. How can she reconcile the kindness of her landlords with the fact that they were Nazi party members since 1933? Her plight underscored the difficulty displaced persons had in proving who they were, getting visas, with so little documentation available. Gerda worked for a while with the Bavarian Aid Society. Her descriptions of the people seeking help are either full of sorrow or ironic humor. Because Kurt and Gerda are both so articulate, their letters, which they translated for the book, are rich reading. They cover daily life, problem solving, hope for their future, acknowledgment of painful realities, yearning for the miraculous appearance of a family member, and, at their core, a deep love for one another. Thanks to my friend Frankie (who lived in London during the war) for turning me on to Gerda Weissmann Klein’s books. These sound excellent. I am always drawn to Holocaust literature, with a particular interest in those who lived in Poland. I’ll have to try to locate these books sometime! I’ve never heard of either book — thanks for the information! She sounds like a fascinating woman, and I would very much like to read these books. Thanks for bringing them to my attention. We posted excerpts from your reviews here on War Through the Generations. Thanks for participating!